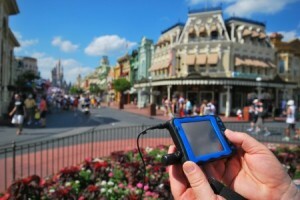 Walt Disney World has rolled out a first-of-its-kind service designed to let blind guests “see” its famed attractions. Called “audio description,” the service provides visually impaired park-goers with a narrative depiction of the scenes that unfold as they move through rides such as the Magic Kingdom’s Haunted Mansion or Pirates of the Caribbean. It is the latest feature added to a proprietary, wireless system that Disney World initially developed in 2005 to help disabled guests. The system, which is offered as a free hand-held device to park-goers, also includes features for deaf and hard-of-hearing guests, such as amplified sound and hand-held captions. For the blind, the device includes a single earpiece — rather than a headphone set. Because people who are blind depend on their sense of sound to guide themselves around, the single earpiece allows a park-goer to leave the other ear unobstructed. The system’s narration is also distinguished from the other audio encountered in a Disney attraction. For example, in the Haunted Mansion, where all riders listen to a ghoulishly themed male voice, the audio description produced by the hand-held device is provided by a female voice speaking in even tones. Other attractions that use the device include the World of Coca-Cola museum in Atlanta and the Hall at Patriot Place in Foxborough, Mass., a hall of fame dedicated to the New England Patriots football team. Disney licenses the technology to Houston-based Softeq Development Corp., which sells the system as Durateq. Disney is now working on expanding the service to include descriptions of outdoor areas in its theme parks.